We help fund and manage projects to conserve, restore and rejuvenate some of the UK’s most impressive and important heritage architecture. The Heritage Lottery Funded projects we’ve helped deliver have sensitively enhanced historic buildings and interiors across the country, opening them up to engage new audiences in their stories. 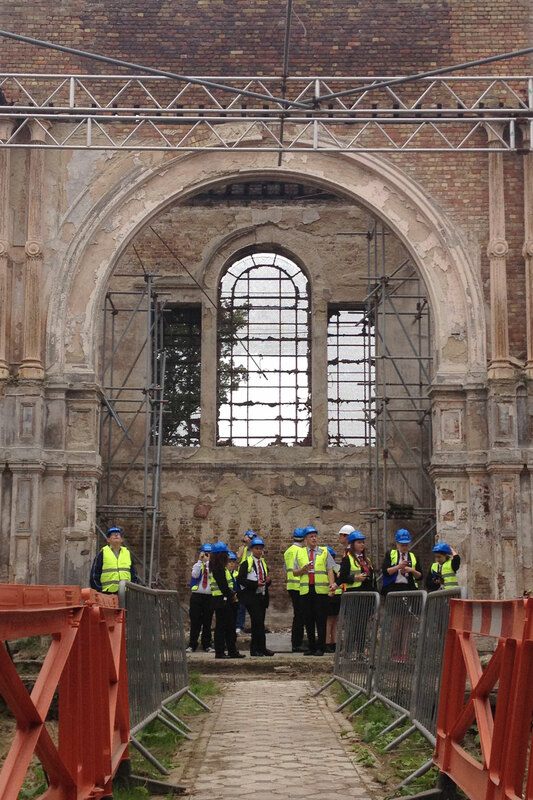 The heritage project at Winchester Cathedral is conserving and re-energising the use and enjoyment of a vital piece of the nation’s heritage, opening up access to the Cathedral’s story and treasures and creating a paradigm shift in visitor experience. Glevum successfully advised ondevelopment of Heritage Lottery Fund round 1 & round 2 securing a grant of £10.5m from the HLF. We continue to be involved in a project management & evaluation role during the ongoing delivery stage. Being part of the team that will conserve and transform this iconic heritage site for the next generation has been a privilege. Turner’s House Trust intends to rescue, restore and make accessible the country villa designed and built by J M W Turner, Britain’s world-renowned landscape painter. Sandycombe Lodge is unique – a neglected and hidden work of art in three dimensions. Grade II* listed, it is the only surviving house in this country designed by a major artist for his own use, one who remains an inspiration for British artists to the present day. Sandycombe Lodge is now on English Heritage’s Heritage At Risk Register. Alongside restoration of the house to Turner’s original design, the project will enable direct and virtual access to the house and its collection by a wide variety of audiences. It will build on already established local and regional educational initiatives, using an exciting range of multimedia tools and working with nearby historic buildings and collections to promote pleasurable and active engagement with Turner, his house and his worlds. Glevum successfully projected managed the Round 1 and Round 2 development periods leading to a successful Round 2 HLF award in September 2014 and are now project managing the delivery. We wrote the full 10 year business plan for the project. We were delighted to be involved with the project at such an early stage of development. Working with a dedicated and experienced groups of trustees & consultants has been an inspiration to us all. The magnificent Painted Hall at the Old Royal Naval College in Greenwich is recognised as the greatest piece of decorative painting in England and has been described as ‘the Sistine Chapel of the UK’. Designed by Sir Christopher Wren and Nicholas Hawksmoor, it was originally intended as a dining hall for the naval pensioners who lived on the site at the Royal Hospital for Seamen. Over the next three years ORNC is embarking on an exciting plan to clean and conserve over 40,000 square feet of the magnificent Grade I listed Painted Hall wall and ceiling paintings. This ambitious conservation project will not only bring back the vibrancy of Thornhill's paintings, but it will also help to tell the many stories of this 18th century masterpiece. Throughout the project there will be opportunities for people to become involved in the process of conservation, learn about conservation techniques and work with ORNC to share the stories told by Thornhill within the painting. There will be an opportunity for every visitor, during and after the project, to take away a new memory, skill, a message or new understanding. To be involved with such an iconic and important piece of the nation’s history is an honour. Getting people involved and accessing this treasure both during the conservation works and beyond is an exciting prospect. Sheerness Dockyard Church was built in 1828 as part of the comprehensive redevelopment of the Sheerness Royal Naval Dockyard between 1813-1830. It is listed grade II* and stands within Sheerness Royal Naval Dockyard and Blue Town Conservation Area. The Church is a rare example of a very small group of Royal Naval dockyard chapels built during the late 18th and early 19th centuries. Only three others survive: St Anne’s Portsmouth, Chatham and Pembroke Dock. The Sheerness Dockyard Preservation Trust aims to rescue the building for the nation and transform it into a unique, innovative, and viable business/events centre for the local community. Save the church from further risk by undertaking immediate urgent repairs and conserving for the long term. Create the Sheerness Enterprise Centre which will bring together, in one place, all of the strands of support for engaging young people to help them develop and sustain their career: from school leavers’ support and training, to premises, business mentoring and career development initiatives. Conserve & return to Sheerness the dockyard model and allow public access via the upper floor of the church. Provide a community café and event space venue for local and regional hire. We are delighted to be working to save such an iconic piece of British naval & ecclesiastical history. Not only will this project save the heritage but provide an innovative space for young people to thrive and prosper. The present church is the first of Hawksmoor’s London Churches to be built under the Fifty New Churches Act of 1711. It provided the template for subsequent projects undertaken by the Commission, using funds from coal tax revenues, and was the first building to be completed in the transformation of Greenwich after the Restoration, involving the same architects and craftsmen used in the building of the Old Royal Naval College (or Hospital as it was then) including Nicholas Hawksmoor, Grinling Gibbons, Sir James Thornhill, John James and Jean Tijou. As well as being a template for the other London churches it was also a workshop for designs used elsewhere in the Maritime Greenwich World Heritage Site. The project plans to work with the local authority, the Maritime Greenwich World Heritage Site partners, local schools and other community organisations to enable a new chapter in the story of St Alfege Church to be established. This project will reveal and bring together the church's hidden places and stories for the first time, re-presenting the church as a valuable resource for interpreting and understanding Greenwich’s rich and diverse history. To ensure that the church is more closely integrated into the local heritage destination and the surrounding community. St Alfege forms an integral part of this World Heritage Site. We are delighted to be working with the dedicated team and wide range of partners to undertake urgent restoration and put the church firmly on the map.